I got an OCZ 120 gig 2 1/2 inch SSD for my Mac Pro and had a go at installing it this morning. A few comments on the choice of drive before we launch into the saga of the install itself. 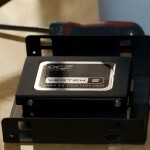 There are a slew of new SATA 3 drives coming onto the market at the moment. 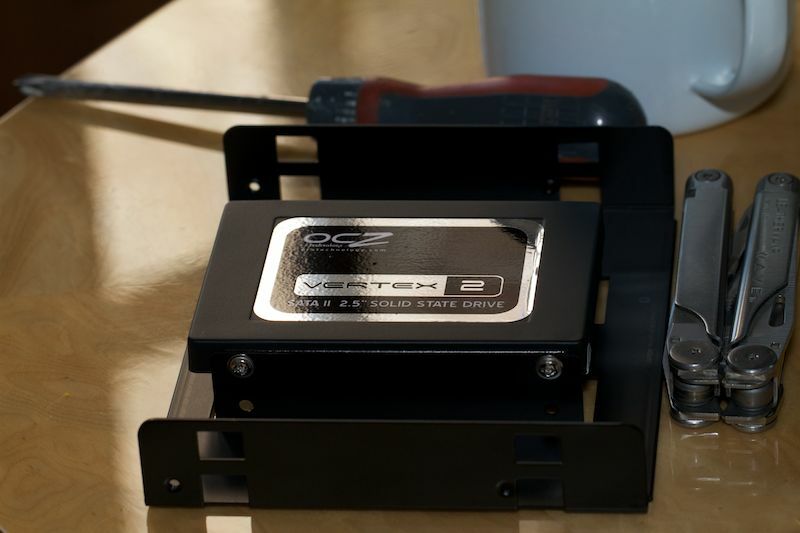 My decision to go with the SATA 2 was simple: I didn’t want to go to the expense of upgrading the controller on the Mac to accommodate SATA 3. At £160, the disk strikes me as pretty good bang per buck, though I’m sure I’ll come back to this post in a couple of year’s time and find the price laughable. 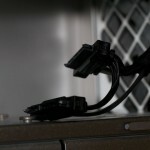 There is a great article on the Mac Performance Guide site that I took as the starting point for what I wanted to do, which was to install the disk in the spare optical drive bay. Leaving the disk dangling loose in the bay rankled with me, so I picked up a pretty cheap 2 1/2 inch to 5 1/4 inch converter [from an outfit called Lian Li]. It was almost a complete waste of time. I took the optical bay out of the chassis and tried screwing the mounting into it, but only the front two screws would line up. 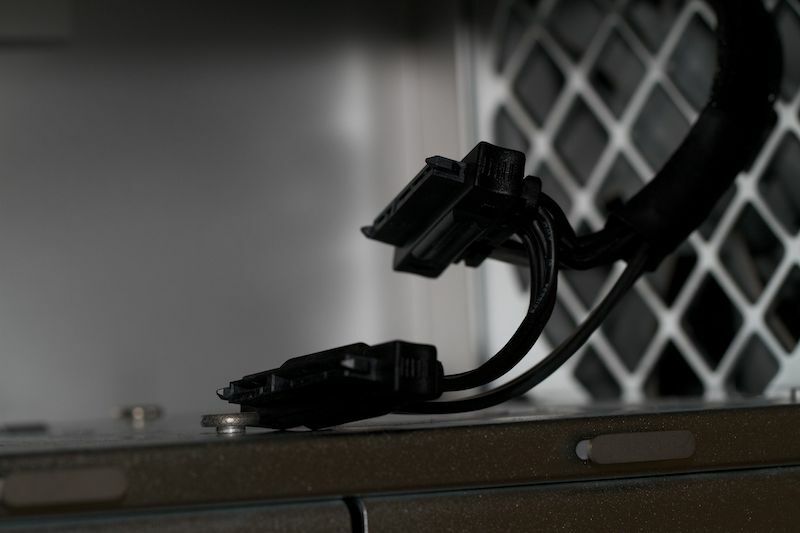 I thought this would be good enough, but the daisy-chain SATA cable that comes off the DVD drive wasn’t long enough, as fixing it into the bay left the mount relatively deep, and the cable wouldn’t stretch. So I left it in the bay, but unscrewed. At least this would constrain the amount of movement that the disk could be exposed to. I restarted the machine, which picked up the drive straight away, and I created a single partition and default journalling file system on it, and then sparked up Carbon Copy Cloner. I’d given the next stage some thought, but filtered through what turned out to be a couple of deluded assumptions. My Mac Pro came with a default single 1 TB disk which I’ve managed to use 3/4 of in the space of about 5 months, with a combination of images and movie files. I figured that, aside from the root level directories that make up the OS install, I would just copy across the applications that I use most and that I’d appreciate the speed-up from the SSD with [so Aperture, Safari, and a few others]; the rest I’d just run off the original disk. I figured that if there were any library dependancies, they would have the same pathnames, and everything would be fine. In short, whether this works is a lottery. In some instances, the application will load fine, and in others you will see a pop-up saying that the application can’t open because ‘it may be damaged or incomplete’. So iPhoto [for instance] doesn’t work, while Opera happily will. So I had to take a few bites at the selective set of files that I was looking to copy over with Carbon Copy Cloner. Some were just daft mistakes on my part, like forgetting to copy over the utilities folder underneath the applications folder. But one of the applications that I particularly wanted to leave on the original drive was iTunes. When I tried to start this, I got a terminal error message which said, ‘You do not have enough access privileges for this operation’. The application would die about 5 seconds later. I spent a lot of time trying to figure this one out, as I’d assumed in the first instance that it was a neighbour of the library problem. I started with a full delete and re-install in the SSD, which didn’t work. I then tried various file permission changes. Again no joy. To cut a long story short, you absolutely have to have a /Users/Shared directory, as explained in this Knowledge Base article. I saw the folder when I was doing the selective copy, figured it was something like a dropbox a la ~/Public, and didn’t bother with it. That’s a couple of hours of my life that I won’t get back :). I managed to carve out 24 gig of the original 730 gig on the pre-installed hard drive, but clearly not without problems. I think, in the general case, you are going to run into problems with this type of approach. Storage is expensive with the SSDs, but if you are trying to be selective in what you copy across [as opposed to the much simpler approach of cloning the original disk], if you don’t know what a directory does, assume that you need it! I still have a lot of tidying up to do. Because of my earlier excitement with the Aperture vault, it’s absolutely enormous [around 100 gig]. So I need to slice and dice this to take full advantage of the SSD and, if I’m completely honest, the original reason that I bought the disk. That said, all of my ongoing imports will be on the SSD. I’ve also left the original disk bootable. I think this makes sense for the time being as the root level OS directories don’t take that much room up. I’ll use soft symbolic links to put all of the apps that I launch off the HDD into the Applications folder [I’ve already tested this and it works fine]. Btw: boot speed. Before the install: 42 seconds; after: 41 seconds. This entry was posted in Technology by webmaster. Bookmark the permalink. Correction on the boot speed: 31 seconds. Doing a clean install would no doubt reduce this further.